Use this form or my address in upper right and a fast response is guaranteed. If a certain cartoon from any catalog interests you, be certain to use the reference number that pertains to that specific cartoon. If you want to verbally discuss a cartoon or project, include your phone number and I’ll call immediately. Thank you for considering my work for your project. Below are answers to basic questions you may have. If there are any other in-depth questions, simply email me and I will answer you as soon as possible. If you would like to verbally discuss something, tell me what number to call you at and I’ll do so as soon as possible no matter what part of the world you’re located in. Thank you! Does buying a cartoon for use in my presentation allow me to also use it in a print advertisement? Can cartoons be colorized and supplied in a high resolution file format for my intended usage? Yes, any black & white cartoon(s) can be colorized and sent in the file format you prefer. Contact me with the reference number of the image(s) of interest and how you will use the work. A higher fee would apply since color adds a greater intrinsic value to the image. You’ll be quoted based on this and how the image(s) is used. Intrinsic value is based on how color can attract a reader or visitor and how it enhances the overall appearance of the format that cartoon is used in, not to mention the additional time involved in colorizing the image and formatting a digital file for your convenience. Don’t hesitate to ask any additional questions on colorizing and formatting work for any project you’re planning. How will the cartoon be provided after I make a purchase using the shopping cart? You’ll get a high resolution image file in JPEG format and the cartoon will be 300DPI and over 1000 pixels in width, This file can be printed out on a photocopier or the digital file can be imported into your intended layout. The cartoon purchase is intended for one-time publishing rights for your chosen usage you paid for. For instance if used in your newsletter for a specific month, it can be used in that one particular issue and will not be used in other multiple formats such as a web page, Facebook or poster. Any cartoon purchase will contain the DansCartoons URL which will appear inline along the edge of the work to act as a deterrent to potential thieves. Do you offer non profit organizations free usage of your cartoons? No. The artwork appearing throughout my catalogs is a culmination of financial investment, time and creativity that is a “for profit” venture based on many years of effort involved in promoting and continually developing an illustration style that is suitable for commercial usage. This online database alone, took over a year to layout, assemble and build to a point where it was suitable for presenting to potential clients…special scripts had to be developed and themes tested, editing done and other links created before the entire site as a whole could be launched. If non profits seriously want a specific cartoon, I am willing to negotiate a usage fee if you are interested in a specific drawing. Simply contact me as I am interested in providing any group or association with high quality single panel gag cartoon humor. Cartoons can definitely be shared though. A big difference exists between “free” usage and sharing since I actually offer social sharing buttons to most platforms that can be found by all of my cartoons larger versions. Your cartoons are available online so aren’t they in the “Public Domain”? It is also worth mentioning that copying or downloading and editing cartoons will be considered a violation of current copyright laws and all IP numbers are recorded if this happens. Don’t risk violating copyright laws when all you need to do is contact me regarding any usage as a simple inquiry is much more appreciated and shows a greater degree of professionalism. 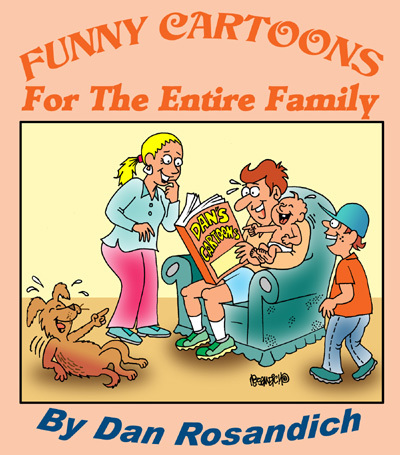 Is Purchasing ‘All Rights’ Available To Cartoons Found In Your Catalogs? Yes, a special agreement can be written and a fee negotiated for purchasing exclusivity to any cartoon offered here on DansCartoons and when making an “All Rights” buy out, all that is needed is detailed information on how you intend on using the cartoon. The greater the use applied to a single cartoon, the more value the cartoon has, since it will represent you or your company in many ways such as on packaging, posters, letter heads, web pages and your digital presence etc. If there are questions, just ask as I have 40 years of negotiating image rights and working out contract specifics on how rights can be transferred. How can a cartoon be purchased and what is the procedure? When you are visiting any of the various categories of cartoons, they are displayed in a thumbnail gallery that allows you to scroll up and down the page. Any image of interest can be clicked which takes you to a larger preview of that same cartoon. Additionally, you can also send payment via check to a business address that can be provided or Western Union is another option.